The Bible tells us that “in the beginning, God created the heavens and the earth.” This week onHome School Heartbeat, Ray Comfort, co-author of the book Made in Heaven: Man’s Indiscriminate Stealing of God’s Amazing Design, shares with host Mike Smith how man has imitated God’s creation. 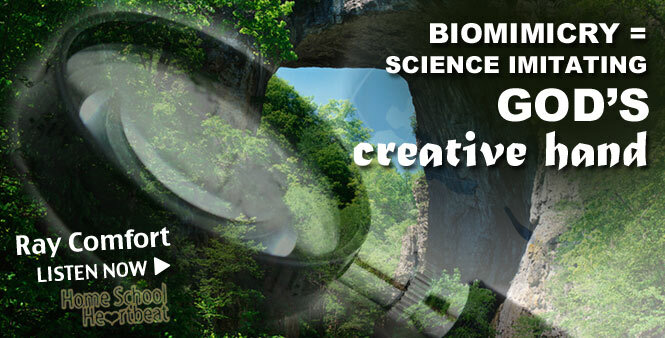 What is biomimicry, and why is it an important subject for homeschoolers to actually study? To hear answers to questions like, How have designs found in nature inspired advances in science? and, What are some of the things we can learn about God the creator from actually studying biomimicry?, listen this week on Home School Heartbeat as Ray Comfort, co-author of the book Made in Heaven: Man’s Indiscriminate Stealing of God’s Amazing Design,shares some of his answers to these questions. ← Don’t Jump Ship! Don’t Quit Homeschooling!